“Many have entertained the idea that the book of Revelation is a sealed book, and they will not devote time and study to its mysteries. They say that they are to keep looking to the glories of salvation, and that the mysteries revealed to John on the Isle of Patmos are worthy of less consideration than these. “In the Revelation all the books of the Bible meet and end. Here is the complement of the book of Daniel.” Thus we can expect that this book “rounds out” all the other books in the Bible, and even more specifically, the parallels in the book of Revelation “completes or perfects” the prophecies found in the book of Daniel. 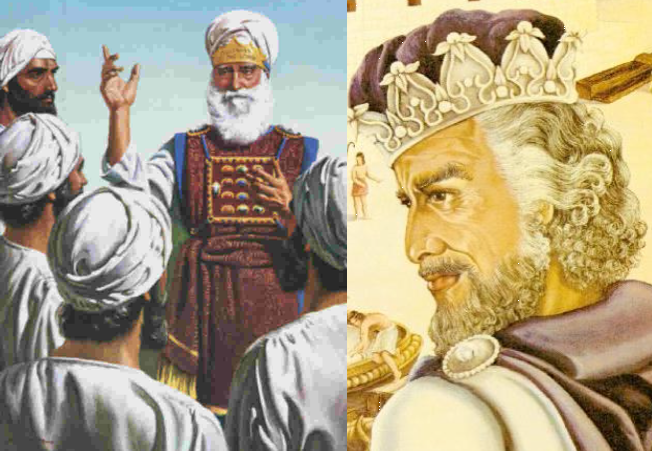 So, it is incumbent upon us as we embark on this most important study, to be on the alert to find those parallels that are complementary to Daniel’s awesome prophecies. That should not be surprising. After all, the same Person who ministered to Daniel, also inspired John. Note: John “wrote down what he saw and heard during his vision,” not what he thought, believed or understood. Daniel, who “heard, but . . . understood not” (Dan.12:8), did the same thing. “None should become discouraged in the study of the Revelation because of its apparently mystical symbols.” “In the revelation given to [John] there was unfolded scene after scene of thrilling interest in the experience of the people of God, and in the history of the church foretold to the very close of time.” In fact “. . . subjects of vast importance were presented to John, which he was to record, that the people of God, living in his age and in future ages might have an intelligent understanding of the perils and conflicts before them.” “Revelation is . . . an opened book. It records marvelous events that are to take place in the last days of this earth’s history. The teachings of this book are definite, not mystical and unintelligible.”  Therefore, we can assume that it is understandable in spite of the fact so many seem to believe it is incomprehensible. 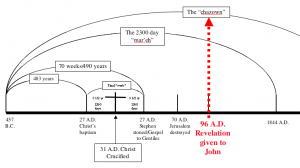 This “Revelation” came 635 years after “Jesus Christ,” named “Michael (Daniel 12:1) . . . the man clothed in linen” (Daniel 10:5; 12:6, 7), delivered the last message that came to Daniel. That last message with Michael standing up in the context of the judgment that began in 1844 (see Daniel 7:26; 8:14; 12:1), concerned the role of Jesus in the heavenly sanctuary setting. Now, in the first chapter of the book of Revelation, we again see Jesus showing His servant John some very special Revelations concerning “things which must shortly come to pass.” We will also find that much of it is depicted in the context of His position in the heavenly sanctuary where He is represented as the Lamb, the most important feature of the sanctuary message. As a matter of fact, the “Lamb” is depicted twenty seven times in the book of Revelation, but only four other times in the New Testament! That fact alone should alert us how important it is to understand the sanctuary message in order to understand what the book of Revelation is all about. By this time, Jesus Christ, call “messiah the Prince” (Daniel 9:25) had been “cut off” “in the midst of the [final] week” of the “seventy” (Daniel 9:27). That happened 35 years before His appearance to John  the very last of the twelve disciples of Jesus. The othrs, by that time, had all been martyred. Now, Jesus, who received His Revelation from God the Father, came to reveal “things” that would soon “come to pass.” As the word “things” implies: “The teachings of this book are definite, not mystical and unintelligible.” And they were to be made known by “his angel,” which must be Gabriel whom the Lord had instructed “make this man [Daniel] to understand the vision [mar’eh]” in Daniel 8:16 as well as more information about the “things that shall be finished” (Daniel 12:7). Daniel finally understood the 2300 day “mar’eh” (see Daniel 10:1). But, details of the “chazown” that Gabriel and Michael purposed to “make [him] understand what shall befall thy people in the latter days: for yet the vision (chazown) is for many days” (Dan.10:14) escaped him. Finally, in frustration, he exclaimed: “I heard, but I understood not” (Daniel 12:8). But, Daniel’s reaction should not have surprised Gabriel because he had already told Daniel to “shut thou up the vision [chazown]; for it shall be for many [or ‘more’] days” beyond the 2300 day “mar’eh” (Daniel 8:26). Later still he repeated: “shut up the words, and seal the book, even to the time of the end” (Daniel 12:4) which is the “chazown” that extends over and beyond the “mar’eh” to the very end of time (see Dan.8:17)! Consequently, since the “book of Daniel is unsealed in the revelation to John,”  it is the end time portion of the “chazown” that is “for . 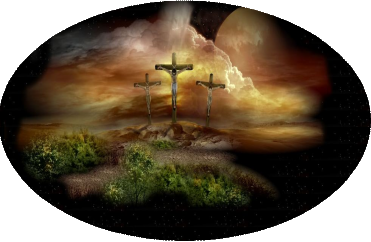 . . the time of the end” (Daniel 8:17) that is now unsealed in the Revelation opened to John. “Why, then, this widespread ignorance concerning an important part of Holy Writ? Why this general reluctance to investigate its teachings? It is the result of a studied effort of the prince of darkness to conceal from men that which reveals his deceptions.” As our exploration of prophecy continues, we will discover that the “Revelation” or the “chazown” really does reveal Satan’s deceptions more clearly than any other book of the Bible! Verse 2: Who bare record of the word of God, and of the testimony of Jesus Christ, and of all things that he saw. This is an important verse. John’s “record” is not what he sat down and figured out based on his own experience or what he knew, it is what “he saw,” and, we might add, what he “heard,” as noted in verse 10. “The Revelation is a factual, eye- and ear- witness report of what John saw and heard while in vision.”  The parallels we find in other parts of the Old Testament, including the book of Daniel, should not be considered evidence of John’s deliberate attempt to include them, but evidence of the Holy Spirit’s influence who inspired all the writers of the Old Testament as well as the New. 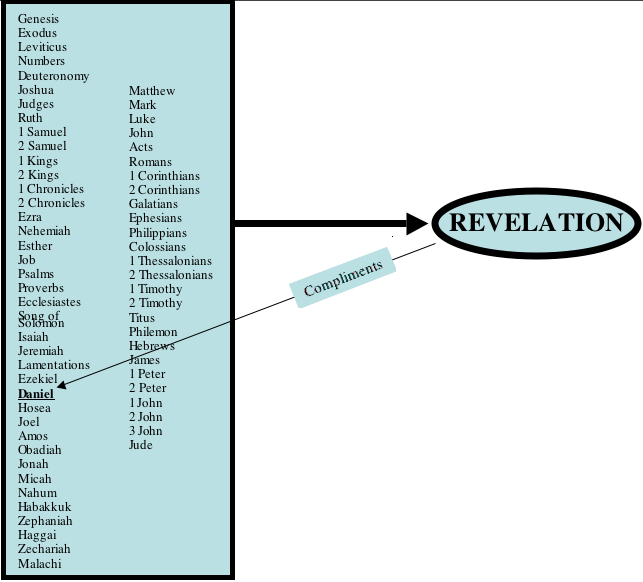 Therefore, parallels between the book of Revelation and many things in the Old Testament are to be expected. God in His great mercy and tender regard for His people, recognizes that unexpected trials and delays are much more difficult to bear than expected ones. “Surely the Lord GOD will do nothing, but he revealeth his secret unto his servants the prophets” (Amost 3:7). “For I know the thoughts that I think toward you, saith the LORD, thoughts of peace, and not of evil, to give you an expected end” (Jeremiah. 29:11). Verse 3: Blessed is he that readeth, and they that hear the words of this prophecy, and keep those things which are written therein: for the time is at hand. While “blessed” in Daniel 12:12 means “how happy?” the Greek word for “blessed,” ““makarios,” also means “happy, “ even “happier.” While Daniel refers to it only once  as a happy, anticipatory state of mind, John makes reference to it seven times (see Rev.1:3, 14:13, 16:15, 19:9, 20:6, 22:7, 14) all of which depict happiness, or confidence in anticipation of some wonderful event. “Says the prophet: ‘Blessed is he that readeth’–there are those who will not read; the blessing is not for them. ‘And they that hear’–there are some, also, who refuse to hear anything concerning the prophecies; the blessing is not for this class. ‘And keep those things which are written therein’ –many refuse to heed the warnings and instructions contained in the Revelation. None of these can claim the blessing promised. All who ridicule the subjects of the prophecy, and mock at the symbols here solemnly given, all who refuse to reform their lives, and prepare for the coming of the Son of man, will be unblest. 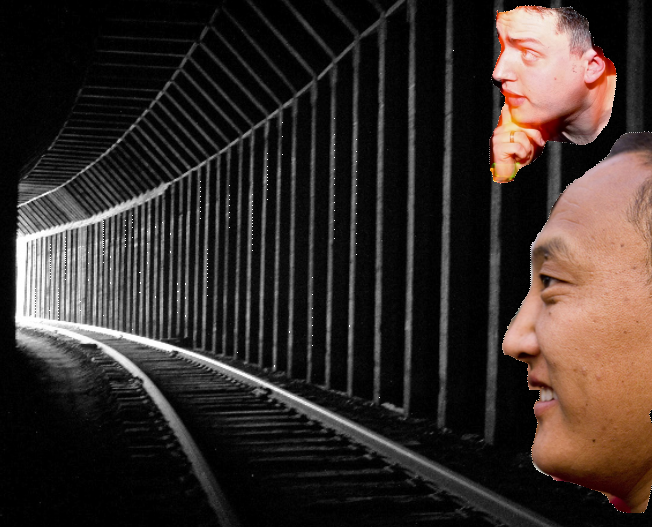 Its like the light at the end of a very long, dark tunnel that inspires confidence and hope. “To John were opened scenes of deep and thrilling interest in the experience of the church. He saw the position, dangers, conflicts, and final deliverance of the people of God. He records the closing messages which are to ripen the harvest of the earth, either as sheaves for the heavenly garner or as fagots for the fires of destruction. Subjects of vast importance were revealed to him, especially for the last church, that those who should turn from error to truth might be instructed concerning the perils and conflicts before them. None need be in darkness in regard to what is coming upon the earth. 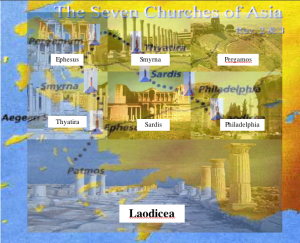 Verse 11 names “the seven [Christian] churches” which actually existed contemporaneously “in Asia” (or Asia Minor, better known as Turkey), back in John’s time around 96 AD when he received this vision. But, it would be unwise to conclude the specific messages assigned to each in the following two chapters, applied only to those ancient churches and have no present day relevance to the churches of our day. Interestingly, in this salutation, “grace” is referred to only one other time in the last verse of chapter 22, and “peace” one other time in the fourth verse of chapter 6 where it is taken away “from the earth” by the rider of a “horse that was red” (Revelation 6:4). But, the giver of both “grace and peace” comes “from him which is, and which was, and which is to come,” who is God the Father. It does not come from “the beast that was, and is not, and yet is” (Revelation 17:8). Does that mean the “beast” is the rider of the red horse? We will find out later. 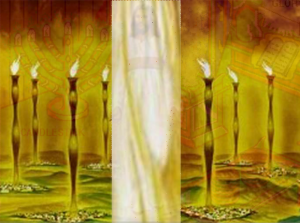 Additionally, “grace” and “peace” come also “from the “seven Spirits which are before his throne.” So, here the Holy Spirit is represented by the “seven lamps of fire burning before the throne” (Revelation 4:5), and the “seven horns and seven eyes” that are “sent fourth into all the earth” (Revelation 5:6). Therefore, the “seven Spirits” must be “the Comforter, which is the Holy Ghost, whom the Father” sent in Jesus’ name. Jesus promised “he shall teach you all things, and bring all things to your remembrance, whatsoever I have said unto you” and “he shall testify of me” (John 14:26 & 15:26). This verse completes the salutation coming from the three Persons of the Godhead, namely “God” the Father who “gave unto” Christ” the “Revelation of Jesus Christ,” the “seven spirits” which is the “Holy Ghost,” and now “from Jesus Christ” Himself. He is “the faithful and true witness” to the very last church, “the church of the Laodiceans.” He is “the prince of the kings of the earth, and “the prince of princes” (Dan.8:25), “Messiah the Prince” (Dan.9:25), “Michael, one of the chief princes” (Dan.10:13) that Gabriel told Daniel was “Michael your prince” (Dan.10:21), “the prince of the covenant” (Dan.11:22), and “Michael . . . the great prince which standeth for the children of thy people” (Dan.12:1). 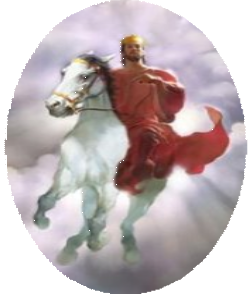 He is the rider of “a white horse” whose name “was called Faithful and True, and in righteousness he doth judge and make war” (Revelation 19:11) and sits astride the same “whitehorse” as “he went forth conquering, and to conquer” (Revelation 6:2) in the “war” between Himself and Satan. In spite of His supremely exalted position He stooped low and “washed us from our sins in his own blood.” Wonder of wonders! What magnificent, awesome, selfless love! Verse 6: And hath made us kings and priests unto God and his Father; to him be glory and dominion for ever and ever. Amen. The Commentary suggests a different reading of the first clause as: “’a kingdom priests’ . . . Christ has constituted His church a ‘kingdom’ and its individual members ‘priests.’ To be a member of the kingdom is to be a priest’”  The same phrase is found in Revelation 5:10 where “the four beasts and four and twenty elders, fell down before the Lamb” (see Revelation 5:8-10) singing He “hast made us unto our God kings and priests: and we shall reign on the earth” which “in chs. 20 and 21 is shown to be in the postmillennial period.” Therefore, we, as believers, are “priests” in His kingdom right now, but “kings” later on when “the meek . . . shall inherit the earth” (Matthew 5:5), the wonderful event depicted in Revelation 21. Verse 7: Behold, he cometh with clouds; and every eye shall see him, and they also which pierced him: and all kindreds of the earth shall wail because of him. Even so, Amen. John was one of the “men of Galilee” who stood “gazing up into heaven” while Jesus “was taken up; and a cloud received him out of their sight” 38 years before. Then two angels announced: “this same Jesus…shall so come in like manner as he have seen him go into heaven” (Acts 1:11, 9). While that experience must have flashed through John’s mind, he may or may not have thought of the same thing Gabriel told Daniel centuries before about the time when “Michael [shall] stand up the great prince which standeth for the children of thy people: . . . And many of them that sleep in the dust of the earth shall awake, some to everlasting life, and some to shame and everlasting contempt” (Daniel 12:1). In both passages, a resurrection of both the righteous and the wicked is depicted at the time of the second coming. Note that while Daniel depicted the resurrection of the wicked in a general manner as those who will arise “to shame and everlasting contempt,” John is more specific, saying only those who actually “pierced him” will be raised at that time. 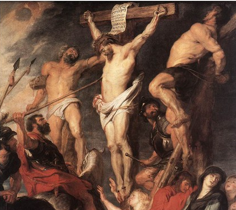 John actually witnessed this happen when the soldiers brutally nailed his beloved Master to the cross and saw “one of the soldiers with a spear [that] pierced his side” (John 19:34). Therefore, John’s message here is parallel, and complementary to Daniel’s, giving us a more complete picture of some of the things Daniel tells us in Daniel 12:1, 2. Therefore, Revelation 1:7 and Daniel 12:2 depict a “special” resurrection which will likely take place at the end of the “thousand three hundred and five and thirty days” (Daniel 12:12). Those who endure will be “blessed” exceedingly when they are reunited with loved ones who died “by the sword, and by flame” sometime after the “vile person,” together “with them that [forsook] the holy covenant . . . place[d] the abomination that maketh desolate” (Daniel 11:30, 32). This brings up an interesting comparison. While all of Daniel’s visions, with chapter 2 ending with the stone that strikes the image on its feet, chapter 7 ending with “all dominions” serving and obeying Christ, chapter 8 ending with the “chazown” lasting more “days” beyond the “mar’eh,” chapter 9 concluding with the “consummation” at the “end of the war,” and finally chapter 12 finishing when “the end [shall] be,” Revelation begins with one the most vivid presentations of the second coming found in either Revelation or Daniel. While many events in John’s vision end near the time of the second coming or describe situations immediately after the second coming, Revelation 1:7 and 6:14-17 are the sole examples of the actual second coming of Christ. Verse 8: I am Alpha and Omega, the beginning and the ending, saith the Lord, which is, and which was, and which is to come, the Almighty. Therefore, like God the Father, “Jesus Christ” is also the self existent One just as He declared to the Jews a few years before when He told them “Before Abraham was, I am.” For that, the Jews “took . . . up stones to cast at him:” (John 8:58, 59). Later, Paul noted, He “thought it not robbery to be equal with God” (Philippians 2:6). Now, Jesus adds, “I am . . . the Almighty”  making Him second Person of the Godhead, the ultimate Source of all that is written in the book of Revelation! 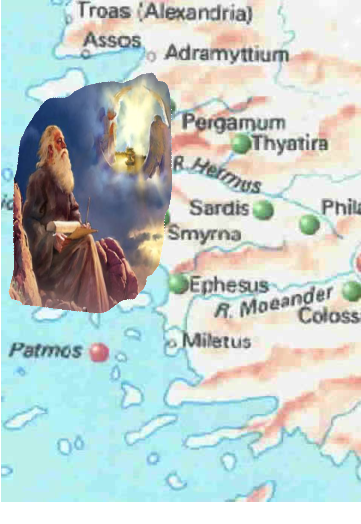 Verse 9: I John, who also am your brother, and companion in tribulation, and in the kingdom and patience of Jesus Christ, was in the isle that is called Patmos, for the word of God, and for the testimony of Jesus Christ. So, the “seven churches which are in Asia” were also suffering “tribulation” that John himself was experiencing being exiled to “the isle . . . called Patmos” out in the Agean sea. Note how John equates “the kingdom” with the “patience of Jesus Christ,” implying that delay would be an important factor in the “tribulation” the church would be forced to experience, and the need for “patience” is an imperative in order to endure. This coincides with the Saviour’s warning several years before when He referred to “that evil servant [that] shall say in his heart, My lord delayeth his coming” (Matthew 24:48), a complaint heard all too frequently even in our day, more than 2,000 years later! John notes being “in the spirit” three other times in chapters 4:2, 17:3 and 21:10 suggesting he was “in the spirit” at other times. For example, in verses 1-9 of this chapter he describes what he saw and heard. But, in verses 7 and 8 when John comments “every eye shall see him” then quotes Jesus saying “I am Alpha and Omega” it would seem he was “in the spirit” at that time. Therefore, it becomes difficult to distinguish when he was actually “in” or “out” of “the Spirit” and we should question the idea that verses 1-9 were only his own ideas because he did not say if he was “in the spirit” at that time. Therefore, it is safe to say what he saw and heard, whither in or out of the spirit, was inspired. They are not his own ideas or conjectures. While the book of Revelation is “the complement of the book of Daniel,” there are distinct differences. 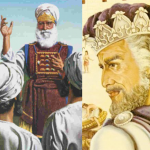 While the visions that came to Daniel occurred “in the second year of the reign of Nebuchadnezzar,” “In the first year of Belshazzar” “In the third year of . . .Belshazzar,” “In the first year of Darius,” and finally “In the third year of Cyrus” (Daniel 2:1; 7:1; 8:1; 9:1 and 10:1), John’s came to him “on the Lord’s day.” Evidently, it all came on that one, Sabbath “day” since John gives no hint that other days were occupied while experiencing other visions. Consequently, it seems, while the book of Daniel depicts several, explicit visions, the book of Revelation is really only one vision that came to John on “the Lord’s day,” the seventh day Sabbath, even though it is conceivable, perhaps likely, it took him many other days to write it all down. Nevertheless, the book of Revelation should be considered as a whole and not a series of disconnected thoughts and ideas. Everything in this book is interrelated. Each passage bears relationship to the others which makes context an extremely important consideration before coming to a conclusion. Consequently, the chapter designations are not part of the inspiration. It was written out uninterruptedly and we should resist the tendency to isolate the chapters from each other and ignore their contexts. While, at this point, John was “in the Spirit,” he was still aware of hearing “a great voice” “behind him.” Therefore, being “in the Spirit,” did not necessarily make John completely oblivious to everything else. Interestingly, the trumpet-like quality of Jesus’ “voice,” identifies the “first voice” John heard in Revelation 4:1 as that of Jesus Himself. His angelic emissaries also sound like a “trumpet” or “trumpets” in Revelation 8:2, 6, 13 and 9:14. In contrast, there are no “trumpets” depicted in the book of Daniel. Therefore, the “trumpet” bears special significance in the book of Revelation. Verse 11: Saying, I am Alpha and Omega, the first and the last: and, What thou seest, write in a book, and send it unto the seven churches which are in Asia; unto Ephesus, and unto Smyrna, and unto Pergamos, and unto Thyatira, and unto Sardis, and unto Philadelphia, and unto Laodicea. Jesus already said “I am Alpha and Omega” in verse 8, making it clear He is equal with God the Father. 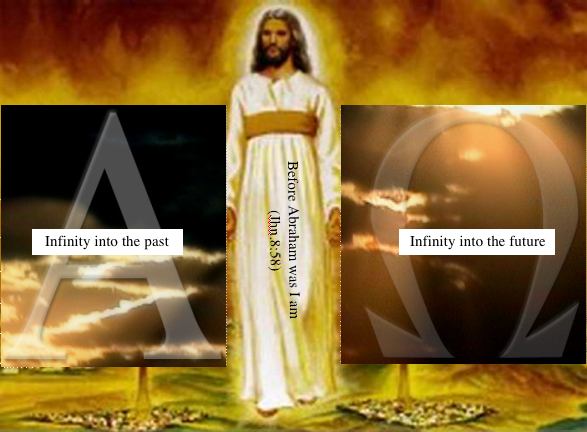 He repeats it twice more in the last two chapters of Revelation suggesting that He ratifies everything contained between chapters 1 and 22 making Him to be the real Author of the book of Revelation and, most importantly, “the center of all hope”  for he is the “Alpha and Omega, the first and the last” of all the subjects in both Daniel and the Revelation. Furthermore, there was never a time in the past, neither will there be a time in the future when He did not nor will not exist. John, we might say, was just His secretary who faithfully wrote down in his own words when necessary. They were what he saw, and, heard rather than what he thought. 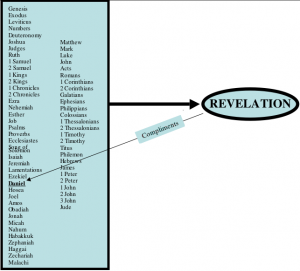 Therefore, the book of Revelation is not an imaginary allegory that John had thought up on his own for the benefit of the “seven churches which [were] in Asia” during his time. So, the approach of One “like unto the Son of man” was from behind the prophet. Perhaps John was facing the sea, at the time of this encounter, reflecting on the various spiritual problems of the Asian churches. Without doubt he was praying for the added wisdom Jesus was just about to provide in super abundance! A quarter of a century before, in 70 A.D., the temple at Jerusalem had been completely destroyed by the Romans. John actually “witnessed the destruction of Jerusalem and the ruin of the stately temple.” Even though the Jewish nation had, out of hand, rejected Jesus Christ as the Messiah, the significance of the seven candlesticks must have been very meaningful to John. Most certainly he was among the disciples when they “were come together . 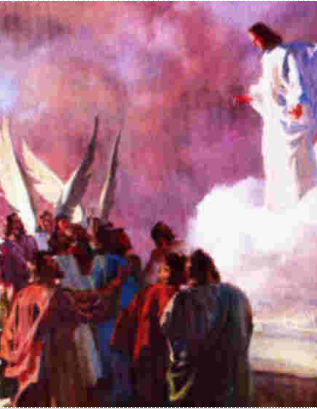 . . while they beheld, [Jesus being] taken up; and a cloud received him out of their sight” (Acts 1: 6, 9). Therefore, John was eyewitness to the fact that Jesus was in heaven. 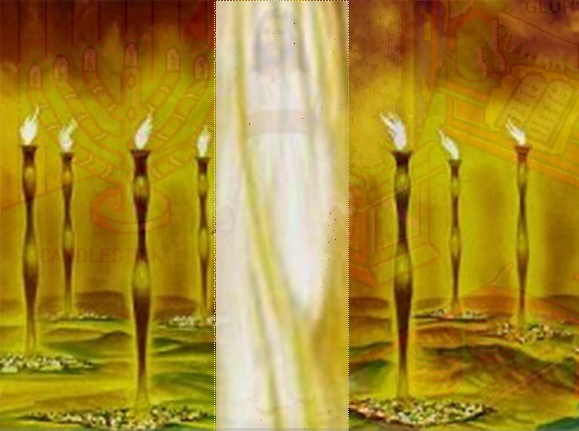 He also knew “seven golden candlesticks” were represented by the “seven lamps,” in the first apartment of the earthly sanctuary (Exodus 25: 37; 37:23). The significance of that symbology (even though Jesus assigned additional meaning to the candlesticks in the last verse of this chapter), that it represented Jesus’ office space in the first apartment of the heavenly sanctuary, must have been clear to John. 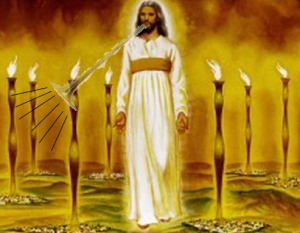 Verse 13: And in the midst of the seven candlesticks one like unto the Son of man, clothed with a garment down to the foot, and girt about the paps with a golden girdle. So, being “in the midst of” His churches suggests He is judging them, not with suspicious paranoia, but with loving concern. His clothing, with “a garment down to the foot,” is similar to the “holy garments” worn by the priests in the typical service of the earthly sanctuary (Exodus 28:2, 4; 20:29; 31:10; 35:19, 21; 39:1; 40:13; Leviticus 16:4, 32). While the hem of those garments must have reached “down to” their feet, Christ’s is the only one so described. And while the priests in the earthly sanctuary all used girdles, Christ’s is the only one that was “golden.” Very likely, His “garment” must be made of “linen” that “a certain man” was “clothed” with in Daniel 10:5 and 12:7. Note the nearly identical title of “one like unto the Son of man” with “one like the Son of man” in Daniel 7:13 who “came to the Ancient of days” at a special moment in heaven’s history. We will find that very same moment depicted in Revelation 5. 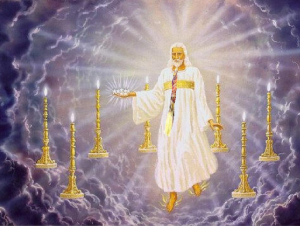 The “Ancient of days,” God the Father, also had “hair . . .like the pure wool” in Daniel 7:9 and the “eyes” of “a certain man clothed in linen,” God the Son, were “as lamps of fire” in Daniel 10:5,6. Verse 15: And his feet like unto fine brass, as if they burned in a furnace; and his voice as the sound of many waters. Although all illustrations leave out something, this picture probably accords better with John’s description of what Jesus looked like. According to Daniel, the “arms and . . . feet” belonging to “a certain man clothed in linen,” were “like in colour to polished brass” and “the voice of his words like the voice of a multitude” in Daniel 10:5,6. Those parallels strongly suggest Jesus is about to give John an expanded, complementary version of what He had told Daniel in the sealed  portion of his message more than six hundred years before. Some, seeing the various differences between Daniel and John’s vision, conclude they could not be showing the same thing. But, we must remember that a complementary vision augments rather than duplicates. Therefore the differences should not be considered exclusionary. Verse 16: And he had in his right hand seven stars: and out of his mouth went a sharp twoedged sword: and his countenance was as the sun shineth in his strength. In contrast, the “man clothed in linen . . . held up his right hand and his left hand unto heaven, and sware” an oath affirming that the career of the “vile person” “shall be finished” after “he shall have accomplished to scatter the power of the holy people” “for a time, times and an half” in Daniel 12:7. Here, His hands hold “seven stars” which “are the angels of the seven churches” (verse 20) which we might think parallel the “wise” who “shine as the brightness of the firmament” because “they . . . turn many to righteousness as the stars for ever and ever” in Daniel 12:3. However, in chapters 2 and 3, not all of them appear to be very wise! This “sword” is “symbolic of Christ’s authority to judge, and especially of His power to execute judgment. That the sword has two edges, together with the fact that it is said to be sharp, would seem to imply the incisiveness of His decisions and the effectiveness of His acts of judgment.” Note His use of “the sword of [His] mouth” as He judges the “church in Pergamos” in Revelation 2:12, 16 and its use in the final, executive judgment where it is used to “smite the nations” in Revelation 19:15. But, another “sword” is featured in Revelation 6:4, 8 that parallels the “sword” of Daniel 11:33 used to persecute “they that understand among the people.” Clearly, that “sword” does not come from Christ’s “mouth.” Rather, it is wielded by His enemies. Finally, John notes Jesus’ “countenance was as the sun,” paralleling Daniel who said “his face” was similar to “the appearance of lightning” in Daniel 10:6. Later on, John repeats that “his face was as it were the sun” in Revelation 10:1. Daniel’s experience was the same. When he saw the “man clothed in linen” he “retained no strength” and fell “in a deep sleep on [his] face . . . toward the ground.” Then “an hand touched” him and he “stood trembling” as the man said “Fear not, Daniel.” While He came to help Daniel “to understand” (Daniel 10:5 to 12) the things that were troubling him, here He reaffirms who He is to John as the “first and the last,” the “Alpha and Omega, the beginning and the ending” as He just did in verses 8 and 11. Therefore, He is the same Person who told Isaiah “I am the first, and I am the last; and beside me there is no God” (Isaiah 44:6). Verse 18: I am he that liveth, and was dead; and, behold, I am alive for evermore, Amen; and have the keys of hell and of death. Twice Jesus claimed to be the “alpha and Omega,” adding He is “the beginning and the ending,” claiming to be the “first and the last,” even the “Almighty” (verses 8, 11 & 17). In other words, He claims omnipotence, nothing can defeat Him, He always was and will always exist “for evermore.” But, here He seems to glory in the fact that He “was dead,” which, to us ordinary mortals, is sure evidence of defeat. To us nothing is worse than death. Satan hoped to discourage Christ assuming “all that a man hath will he give for his life” (Job 2:4). Probably the most powerful temptation Jesus ever faced was when He was taunted to “come down from the cross, and we will believe” (Matthew 27:42) you. He could have done it easily because He is the “Almighty.” But, He did not because He loves us who deserve the death He suffered. So, because he chose to die, it was a tremendous victory instead of defeat. His victory gave Him “the keys of hell and of death” making Him the door-keeper of eternal life. This same metaphoric “key,” representing power and authority, will be encountered three more times in Revelation 3:7; 9:1 and 20:1 where it appears to trade hands on one occasion. In reality, however, it will always be His. Interestingly, the command to “write,” repeated sixteen times in Revelation (Revelation 1:11, 19; 2:1, 8, 12, 18; 3:1, 7, 12 (twice), 14; 10:4 (twice); 14:13; 19:9 & 21:5), is never seen in the book of Daniel. Possibly this was because Daniel’s writings were eagerly sought after, read and distributed by his peers, while John, exiled to the lonely isle of Patmos, had no cause to believe his writings would ever reach beyond the shore of his island prison. Little did he know it would comprise the very last book of what we now call the “canon” of scripture. It has been a source of comfort, inspiration, and guidance to the Christian church from his day to ours. Extraordinarily, it was peculiarly designed to be of especial benefit to the very last church, which we shall soon see. 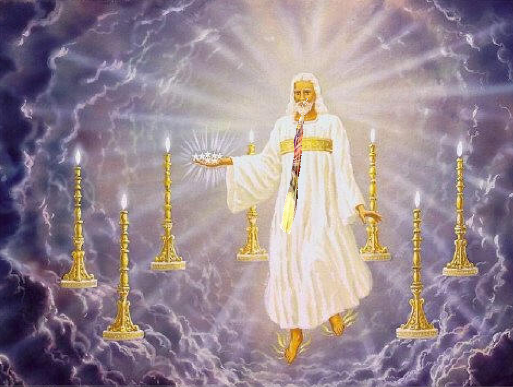 Verse 20: The mystery of the seven stars which thou sawest in my right hand, and the seven golden candlesticks. The seven stars are the angels of the seven churches: and the seven candlesticks which thou sawest are the seven churches. 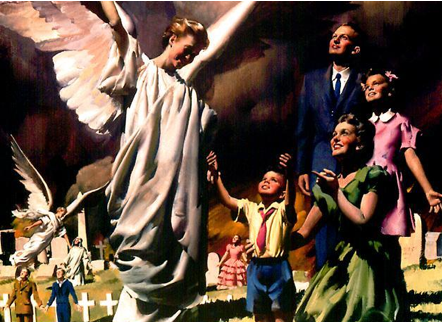 The “mystery” or the “secret” of the “seven stars,” being “the angels of the seven churches” suggests the “angels” to be heavenly beings as guardians of the “churches” or figurative of human beings given the mission to lead and guide them. The Commentary suggests that “Angels” can be understood as “celestial or human” and figurative of the “respective elders, or overseers” of the churches “in John’s time.” But, since “The names of the seven churches are symbolic of the church in different periods of the Christian Era” their “messages [also] extend to the end of time . . .” while the “angels” appear to represent the leaders of the various churches, not only during those specific times, but our time as well. Since the “candlesticks . 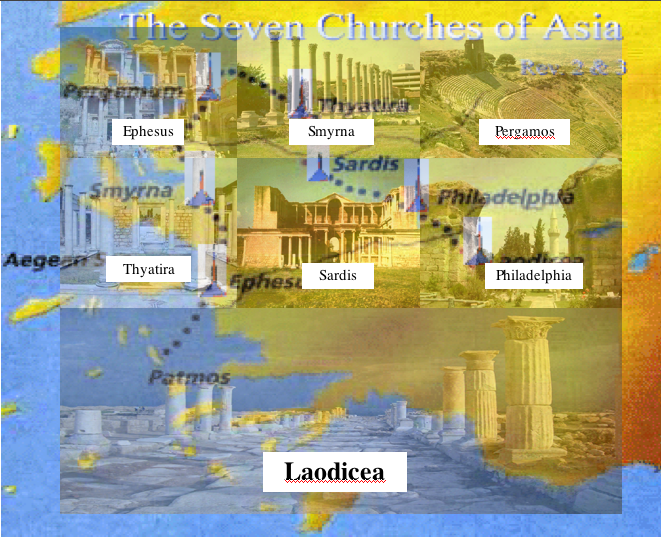 . . are the seven churches,” which are itemized in the next two chapters, it is interesting to note that a “candlestick” is mentioned only twice in association with the church of Ephesus in Revelation 2:1 and 5, and not again until Revelation 11:4 where only “two candlesticks” are mentioned. We will find out why when our study reaches chapter 11. Summary of chapter 1: The Revelation comes from Jesus and is by Jesus Himself who is the beginning and the ending of all things. Since all the other books of the Bible “meet and end” in the book of Revelation, it is of enormous importance especially to the last church represented by the name “Laodicea” which God intends to bless in a very special way with the messages of Revelation. It came to John on the “Lord’s day” which is the seventh day Sabbath. 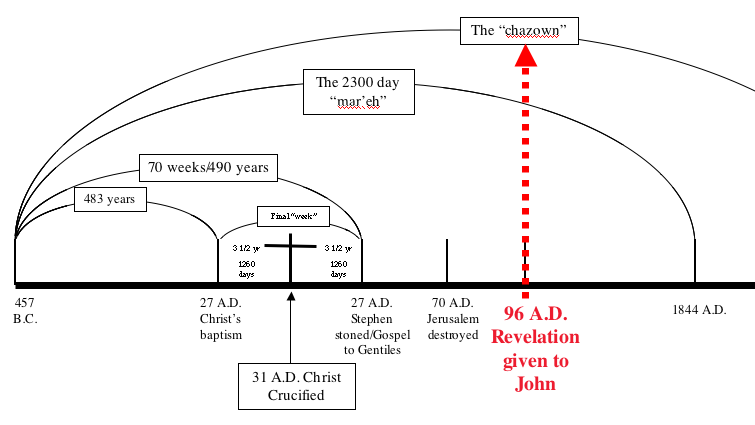 Its numerous symbols should not be allowed to discourage investigation, but, fundamental to the understanding of the book of Revelation is a thorough understanding of the book of Daniel, especially the “chazown” part of his prophecies which extend to the end of time. This is emphasized by the parallels in Revelation to Christ’s appearance in the book of Daniel as “the man clothed in linen” in Daniel 10:5; and 12:6, 7. Seeing Christ here in the midst of the seven candlesticks not only represents His personal relationship to the earthly church, but His position in the first apartment of the heavenly sanctuary at the beginning of John’s vision. Medical Ministry page 37 (italics supplied) Evidently, its importance “exceeds” even the prophecies of Daniel! While the word “blessed” is actually found four other times in Daniel 2:19, 20, 3:28, 4:34, they are from the Aramaic “b@rak” (Strong’s #1289) “to kneel,” offer “praise” etc. in worship. But, in Daniel 12:12 it is from the Hebrew “’esher” (Strong’s #835) “how happy!” a happy, anticipatory state of mind. So, it is the only one that parallels “blessed” in Rev.1:3. I refer to this verse at this point because of the similarity of wording, between Christ and the Anti-christ. If you have not followed the reasoning between the “mar’eh” and the “chazown,” go back and start over again, particularly with Daniel 8 and onward. Remember, Revelation is the “complement” of the sealed part of the book of Daniel. If it appears “him which is, and which was, and which is to come” in verse 4 is thought to be God the Son, take another look at verse 4 and read on to verse 5 where John then refers to “Jesus Christ.” Therefore, verse 4, must be referencing God the Father. “almighty” from “pantokrator” (Strong’s #3841) “he who holds sway over all things; the ruler of all; almighty: God.” Used ten times in the New Testament, one is in 2 Cor.6:18, all the rest are in the book of Revelation. See, Rev.4:8; 11:17; 15:3; 16:7, 14; 19:6, 15; 21:22. It is translated “omnipotent” in 19:6.
 many believe “the Lord’s day” was Sunday. Not so. 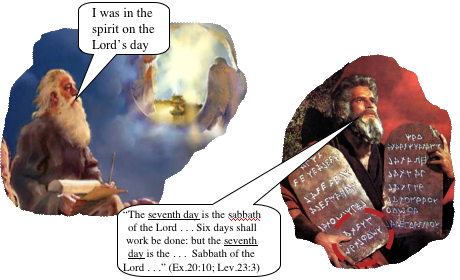 Instead, it was “the seventh day” called “the Sabbath of the Lord” in Exodus 20:10; Leviticus 23:3 and Deuteronomy 5:14. The “sealed” part of Daniel’s visions were the “chazown” that Daniel was told “shut thou up the vision [chazown]; for it shall be for many [or ‘more’] days” in Daniel 8:26; and “thou, O Daniel, shut up the words and seal the book, even to the time of the end” in Daniel 12:4.